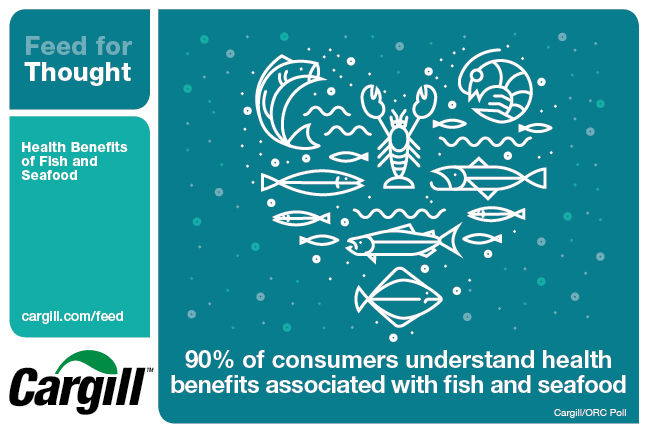 MINNEAPOLIS - May 4, 2016 – According to a recent Cargill Animal Nutrition survey, U.S. consumers recognize there are more health benefits associated with eating fish and seafood compared to taking fish oil supplements. Consumers understand that the health benefits of fish, the world’s fastest growing protein source, outweigh that of fish oil supplements, despite their popularity. While one-third (33 percent) of U.S. households take fish oil supplements, more consumers (90 percent) across all generations associate health benefits with fish/seafood over fish oil supplements (82 percent). According to the study, the top three benefits consumers associate with seafood consumption are heart health (60 percent), low fat (49 percent) and brain health (41 percent). Recent research shows consumer perception to be correct: eating whole fish is more nutritious than consuming a fish oil supplement. Studies show that adding fish oil alone to the diet does not necessarily improve cardiovascular disease risk or cognitive health, two of the health benefits most cited by consumers in the survey¹. Fish provides healthy oils that are absorbed around nine times more than oils from a fish oil supplement². Researchers recommend consumers follow the American Heart Association guidelines and incorporate a variety of oily fish into their diet at least twice a week to get the recommended amount of Omega-3 fatty acids and vitamin D.
Results of the survey are also in line with industry data that suggests the demand for fish is growing, driven by an increasing and more affluent global population that understands the health benefits of eating seafood³. Seafood demand is expected to increase by 70 percent by 2050, and it’s a demand Cargill and the industry are working to satisfy. ¹Rethinking Fish-Oil Pills for Heart and Brain (2012). Tufts University Health and Nutrition Letter, Volume 30, Number 8. ²Ghasemifarda, S., Turchinib, G.M., Sinclaira, A.J. (2012). Omega-3 long chain fatty acid “bioavailability”: A review of evidence and methodological considerations. Progress in Lipid Research, Volume 56, Pages 92–108. The online survey for Cargill Animal Nutrition was conducted by ORC International April 7-10, 2016, and polled a demographically representative sample of 1,029 U.S. adults. This is the inaugural survey in Cargill Animal Nutrition’s new Feed for Thought research initiative. Feed for Thought will periodically explore key perceptions and opinions of the animal protein supply chain.